My Alma Mater did a piece on me, as part of the Research Issue of the Stevens Indicator Magazine. Incredibly lucky to have been featured w/ some of the great technologists of the decade and have my interests be shown in a candidly done story by Rebecca Markley and photograph captured by Chynna Destafano. February 23, 2019 by Payal Yokota. This year I’d wanted to get involved in more writing projects that focused on catering to broader audience. I took a break from cancer research through my graduate work and now coming back to it, but if you met me.. I will always introduce myself as an immunologist with deep interest in cancer. But, so much of it is lost when information is not available to patients and civilians (those who are not life scientists). So, I joined OncoBites in hopes to practice writing complex and highly technical information in a less technical way, and here’s my first post. Please feel free to comment on the blog or here and tell me what you think and how I can improve! Tagged with #GdTcells #cancerimmunotherapy #CARs #CARTs #BiTes. 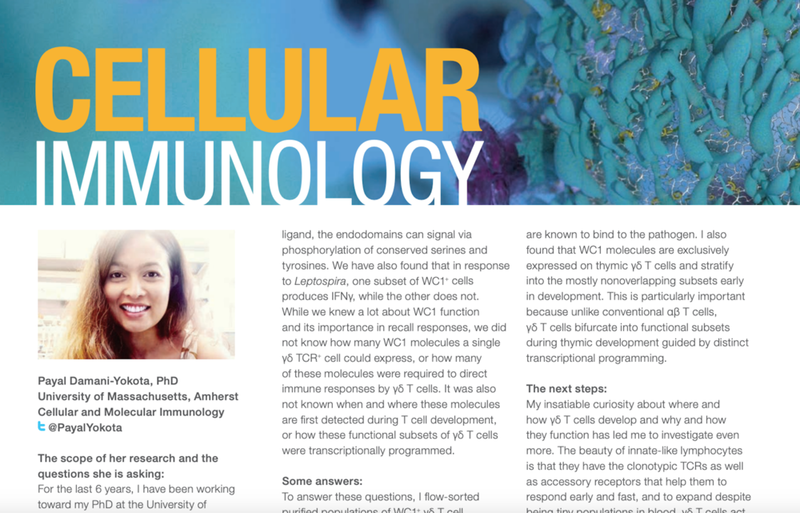 Check out this small chat I had with the folks at Thermo Fisher as part of their “Life in Lab” 2018/19 issue. November 10, 2018 by Payal Yokota. This part of the series will aim to discuss the detailed developmental steps of the trans-differentiation of CD4+ Vδ1+ γδT-cells to fully functional αβ T cells. The CD4+ Vδ1+ γδT-cells clones were reportedly extremely long-lived and had a downregulated expression of CD34. In the clones that continued to grow with Vδ1+ γδTCRs, authors tracked the commitment change to αβTCR over one month. At day 7, the initially Vδ1+ γδT-cells that were negative for αβTCR, now started to express an αβTCR and became low on γδTCR. This expression profile changed entirely on day 28, where the cells became αβTCR(+) γδTCR(lo). The CD4 and CD8 expression on these clones was also evaluated and it turned out that the cells remained either SP CD4+ or changed their co-receptor from SP CD4+ --> DP CD4+/CD8dim. This resulted into cell pool containig either SP CD4+ or SP CD8+ αβTCR(+) T cell clones. Original figure (5) from the paper shows more details on staining. Cells undergo β-chain selection with a fully formed Cβ chain, cells undergo DP-like developmental stage, where the expression of CD4+CD8+ αβTCR is dim but the competitive binding of Vβ1+Vδ1 vs. Vβ+Vα+ begins. Finally, the SP TCRαβ+ cells yield CD4+ or CD8+ αβ+TCR cells. This summary can be shown graphically in the following summary figure extracted from the paper. If, under severe inflammatory conditions, a mature Vδ1+ γδ TCR can undergo gene re-organization and form a fully functional CD4+ or CD8+ αβ TCR, that not only changes our convention of T-cell lineage but also build on the existsing perspective of the plasticity of these re-arrangements. As a γδ T cell scientist, I always enjoy a paper that shows ways to expand and functionally characterize the non-conventional T cells in humans. While, some schools of thoughts still categorize γδ T cells as innate like lymphoid cells (ILCs), there are many that consider γδ T cells to be a member of the adaptive arm. Me, on the other hand, would go even a step further and put them in yet another category of "bridging immunity". 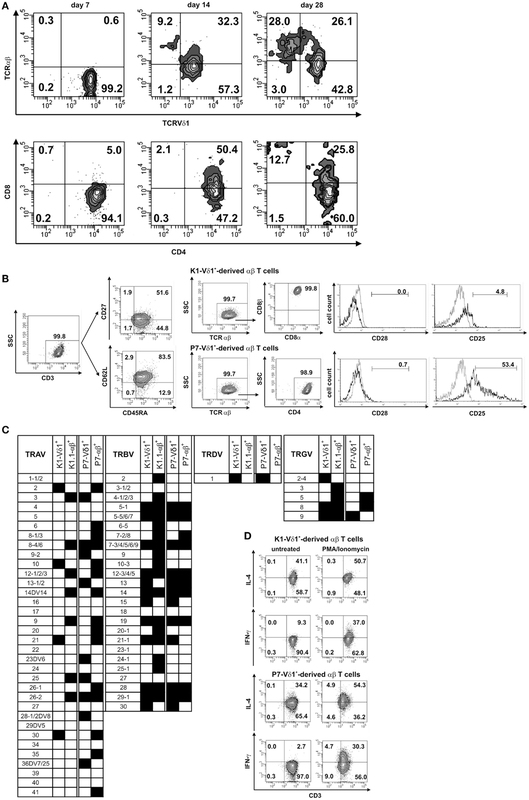 While, γδ T cells are first to respond at sites of inflammation in many models and are able to expand in recall responses, Ziegler shows that they are also able to trans-differentiate into fully functional αβTCRs. Further experiments need to be done in different model systems to truly assure that the clonal reorganization of TCR commitments is changing and not just an artifact. Ziegler et al does a fantastic job in their discussion by validating the findings by comparing them to evidences put forth by other papers in the last couple decades. It would also be interesting to see this sort of a model for gene re-organization in more severe infectious models such as HIV and malignant tumors. One wonders if the tumor microenviroment poses such reorganization and if so, does that make the tumor malignancy more severe? Please feel free to clarify points that I may have missed or misinterpreted. 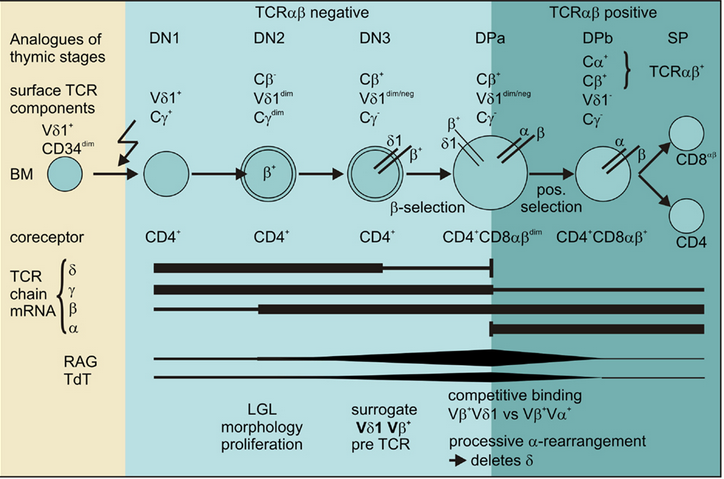 Tagged with T cells, γδ T cells, trans-differentiation, T cell clone expansion. May 11, 2015 by Payal Yokota.